Wrap your self in the softness of the luxurious 100% Rayon from Bamboo sheets like those found in royalty homes. You won't be able to go back to cotton sheets after trying these 100% Viscose from Bamboo sheets. Amazingly soft similar to cashmere of silk. 60% more absorbent than cotton. Sustainable, fast growth rate over 1 meter per day. Requires significantly less pesticides than cotton and is naturally irrigated. Natural anti-bacterial and deodorizing properties. *" Viscose from Bamboo " or " Rayon from Bamboo" are both interchangeable common terms used when referring the Bamboo fabric derivatives. Bamboo woods undergo additional process before the fibers are spun into yarns. Therefore, bamboo yarns are turned into a Viscose or Rayon than woven to create bamboo fabrics. * Bamboo is one of the fastest growing plants because of it's ability to absorb water and is thus a very environmentally friendly material. These are the " Greenest Sheets" around. This explain why bamboo sheets wick so much water away from the body, keeping people dry and comfortable. * 100% Rayon from Bamboo (Viscose) "Super Soft"
Twin Extra long 3PC Sheet Set: 1-Twin XL Flat Sheet 70x102", 1-Twin XL Fitted sheet 39x80" and fits up to 16" mattress & 1-Pillow case 20x30"
Full 4PC Sheet Set: 1-Full Flat Sheet 80"x94", 1-Full Fitted Sheet 54x76" and fits up to 18" mattress & 2-Pillow Cases 20x30" Each. Queen 4PC Sheet Set: 1- Queen Flat sheet 92"x102", 1- Queen Fitted 60"x80" fits up to 18" mattress & 2- Standard Pillow cases 20"x30" ea. Olympic Queen 4PCSheet Set: 1 Olympic Queen Flat Sheet (98x102") , 1 olympic queen fitted Sheet (66x80") and 2 Pillow Cases (20x32") ea. King 4PC Sheet Set: 1- King Flat sheet 110"x102" , 1- King Fitted 78"x80" fits up to 18" mattress & 2- King Pillow cases 20"x40" ea. California King 4PC Sheet Set: 1- Cal-King Flat sheet 110" x 102", 1- California King Fitted 72" x 84" fits up to 18" mattress & 2- King Pillow cases 20" x 40" ea. 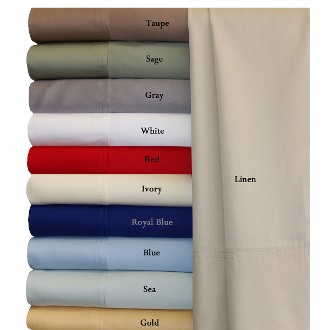 Split King Size 5PC Sheet set: 1 flat Sheet (110x102") , 2 fitted Sheets (39x80") ea and 2 pillow cases (20x40") ea. Machine wash in cold water.Delicate cycle with mild detergent. No Bleach. Tumble Dry on low heat. Remove immediately at end of cycle. Press with warm iron if needed. Do not Use Hot water.